This May, the University of Pennsylvania School of Law will award an honorary degree to Pakistan's leading human rights lawyer Asma Jahangir as part of Penn's 2016 Commencement. The Law School will be hosting a conversation with Jahangir on Sunday, May 15th at 1 pm, and has graciously invited colleagues/students affiliated with the South Asia Center join them for this event. Graduating students and their family/guests are welcome; please contact jchavez@sas.upenn.edu as soon as possible if you would like us to reserve tickets on your behalf. 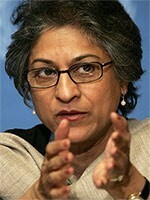 Asma Jahangir is known globally as Pakistan’s leading human rights lawyer. For her relentless courage in challenging extremist laws that violate human rights, Jahangir continues to face death threats. In the early 1980’s, in the face of radical Islamization of Pakistani laws by the then dictator President Zia-ul-Haq, Jahangir with her sister Hina Jilani (Penn Law Bok Global Professor September 2016), formed the first ever law firm by women for women, to challenge Zia’s Islamization policies that threatened the rights of women, religious minorities, and children. In 1983, Jahangir defended a blind, 13 year old girl, who had been raped by her employers, had been accused of zina (fornication) and had been sentenced to three years of imprisonment and flogging. Subsequently, Jahangir was placed under house arrest and then imprisoned. Safia Bibi’s sentence was overturned by the Federal Court. In 1995, Jahangir represented a 14-year old Christian boy – Salamat Masih, accused of blasphemy and sentenced to death – a violent mob outside the Court smashed Jahangir’s car, assaulted her driver and threatened the safety of her family members. Salamat Masih was acquitted. In 1999, Jahangir and sister Jilani represented Saima Sarwar, who was seeking a divorce from her abusive husband. Sarwar was subsequently murdered in an act of honor-killing that took place in Jahangir’s offices. Jahangir and Jilani have galvanized support to overturn the laws that allow for impunity in cases of honor- killings. Jahangir has served as UN Special Rapporteur on Extrajudicial, Arbitrary or Summary Executions from 1998 to 2004, and UN Special Rapporteur on Freedom of Religion and Belief from 2004 to 2010. Jahangir has received nominations for the Nobel Peace Prize and received numerous awards including the Martin Ennals Award for Human Rights Defenders, the UN Millennium Prize, and the prestigious Hilal-i-Imtiaz – one of the highest civilian honors given by the Government of Pakistan. Jahangir will receive the honorary degree of Doctor of Laws from the University of Pennsylvania on May 16, 2016.